Don’t get me wrong, I love travelling with friends, I love being around people and I’ve had some of the most amazing trips with friends like my trips to Morocco and Chicago, but there is something hugely liberating about travelling alone. There’s something satisfying about getting on that plane alone; arriving at your ‘home’ for the duration of your trip, and really taking some time out for yourself. I love the freedom to do what I want and when. That may appear a little selfish, and I’m not a selfish person, but it’s true and I learn something new about myself every time I travel alone. …fast forward three years and plenty of solo trips later, and I absolutely love it. I would encourage anyone to take that leap and do it at least once. It’s that same old saying ‘if you don’t try, you won’t know’. You may write to tell me that really hated it . Or, you may tell me that you wished you’d tried solo travelling sooner and you absolutely loved it, especially to somewhere like Porto where it feels completely felt safe for a little break. The people were friendly and the city was easy to navigate. It’s small enough to not feel intimidating, and it’s a good city to pick if you do feel like taking a first trip solo. So, why Porto? I didn’t travel to the city for its wine, nor its churches or its food, I travelled because I’d been to Lisbon the year before and I had an image in my mind of colourful buildings teaming down the hill all the way to the River Douro – an image I wanted to see for myself. While Porto lacked the wow factor of Lisbon, it’s still a beautiful riverside city with lots of traditional – not too touristy – charm. I had a lovely Airbnb all to myself at the quieter end of Rua Santa Caterina which is the main street that runs through the city. And, it was lovely to have some quiet time after a day of exploring and walking. One thing I found out in Porto is that you have to do a bit of leg work. Even though it’s a fairly small city, many of the streets are up hill. At the end of a day, you do feel like you’ve had a work out, but in a good way. The location of my Airbnb really was ideal. It’s the main shopping street and home to many cafes including the famous Majestic Café, a place to treat yourself, and considered one of the most glamourous venues in the city. You can feast your eyes on some spectacular views of the city without having to do any real research. That’s something I found out within my first hour of arriving. I left my Airbnb and took a wander. That feeling of being free; of being somewhere new excites me; I could do exactly what I wanted to, no one knew me and I didn’t know them. I like that feeling. I had nothing but myself, my phone and my camera, and I walked into a beautiful sunset. I came back to Sé Cathedral a few times, but the sunset on my last evening was pretty special. Like I said, Porto is a small city, and apart from the day I took the tram to Foz do Douro (line 1) a little town with a beach, I walked everywhere. Being able to walk around a new place means you see so much more. I stumbled upon so many cute streets where the light was beautiful early morning and again mid-afternoon, and cafés like the Hungry Biker. Hands down, this became my favourite café - it’s not typical Portuguese, but it was such a lovely place. Light and airy with a sweet healthy menu. I popped by for breakfast and lunch most days. I think I ate the whole menu on my many visits, it was so good. The porridge (which I’ve tried and failed to recreate as good as the Hungry Biker) was so nourishing and it really was delicious, as well as their yogurt with berries and the most yummy toast with some of the tastiest toppings I’ve seriously ever had, plus huge mugs of freshly brewed tea. I always arrived just before it got busy and the bonus was I got to chat with the owners. It’s also very photogenic, highly instagrammable, and it was located on what had to be my favourite street of the city, Sâo Nicolau. So, what else did I do in Porto? 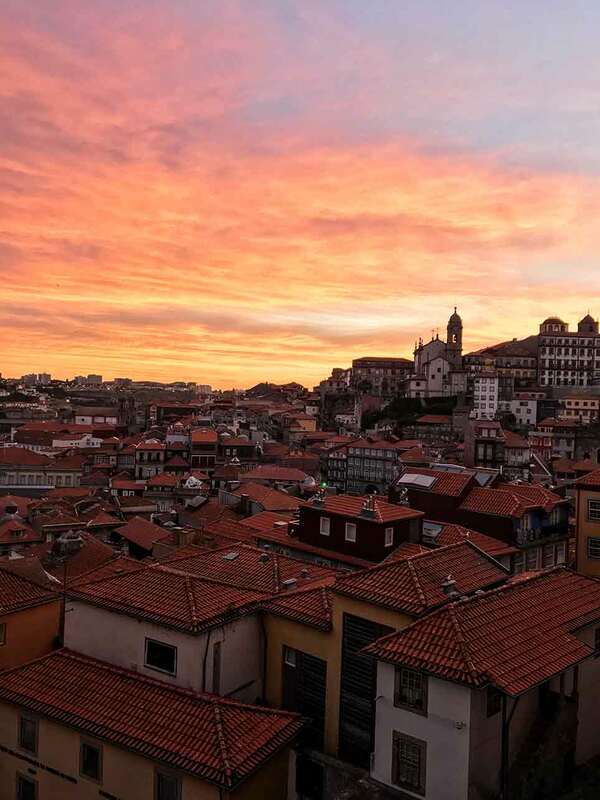 I climbed the 240 steps to the top Clérigos tower, probably the most famous tower in Porto. The view from the top is well worth the climb. 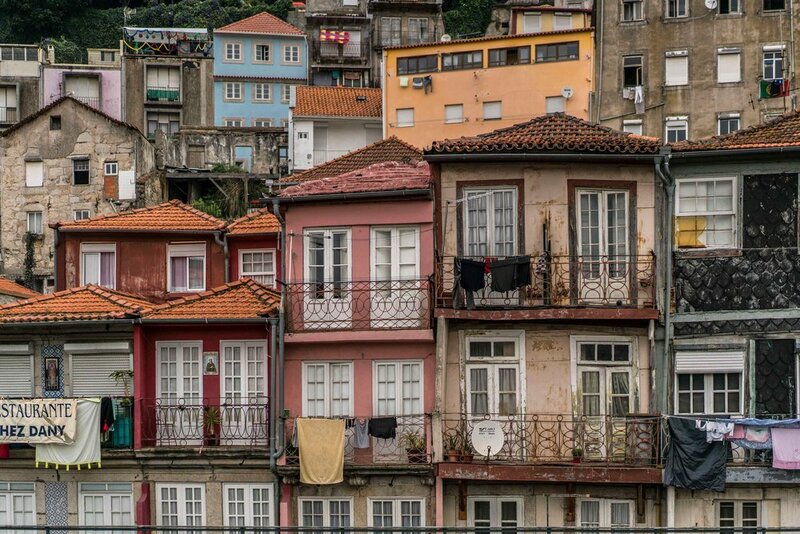 I got lost in the brightly painted houses of the Ribeira district, probably the most photographed area of the city. I took photos of the blue and white Azulejo tiles in what’s probably one of the most beautiful train stations, Sao Bento. I ate crumbly gooey Portuguese custard tarts in Mercardo do Bolhão. Markets are always a must visit in any city. I was a little sad as this market felt like it was on its way to extinction. The building of the Mercado is without a doubt traditional, authentic and beautiful. The staircases give a real sense of grandeur, and I couldn’t help but imagine what the market would have been like in its heyday. I imagine it would have been so full of life; market traders would be shouting out to each other, they’d be a riot of colour and a whole heap of tempting smells; old men would stand about gossiping while their wives would be shopping, but sadly so much of the market was desolate. I guess that’s a sign of the times – people are heading to big supermarkets now days. I took a photo of this man at the market the first day I visited, and I noticed he was stood in the same place, at the same time every day that I popped by. He looked so melancholy. I watched him watch the market from the upper level, he smoked a few cigarettes, and then hobbled off. I walked across Porto’s iconic Ponte Luis I bridge to Vila Nova de Gaia where I strolled along the riverfront, gazing back over the river to Porto. I carried on walking all the way to the fishing village of Afurada. It was a long two-hour or so walk, but along the way I stopped to watch river-life roll by, I felt good for the walk and I was lucky enough to have blue skies and sunshine for the entire time. I don’t often meet up with anyone when I’m away. I know lots of my friends meet up with people they follow on Instagram. Quite often I’m only in a city for a long weekend, so time is a factor. But in Porto I met João (@joao.bernardino) - we follow each other on Instagram, and when João asked me to meet really early, I said ‘yes’. It was perfect. I get up early anyway, mornings are beautifully quiet and they’re usually a good time to shoot empty streets and observe the streets as they start to come to life. We actually hoped for a foggy morning (which really excited me), but instead we were treated to golden sunlight. João also updated me on what was about to happen that evening. And, oh wow. Even though I’d been pre-warned by my Airbnb owner and João, I had no idea São João celebrations was as huge; as lively; as crazy; as merry. Even now, I’m finding it hard to describe this festival, and unless you’ve experienced São João in Porto for yourself it’s hard to put it into word. I was told no one does this festival quite like Porto, and I think they were right. The people of Porto know how to party HARD! It’s like Christmas, New Year, Halloween, Easter, clubbing in Ibiza all at once in every street, in every alleyway, in every little pocket of the city. Midnight sees the inevitable climax of fireworks and illuminations on the river, and the night is far from over. As dawn approaches the celebrations continue well into the next morning. And, as the street clean up commences , I saw people still merry on life and still partying. People start the build-up to São João several days before the day itself. These celebrations have taken places for centuries, and over that time many traditions have been created. The streets and literally every house is draped with colourful bunting, prizes are awarded for the best decorated Bairros (neighbourhood), people get ready to cook their feasts of grilled sardines and peppers which waft through the air, little pots of herbs are placed in shop windows, bars and cafes open their doors, but these are outnumbered by hastily erected barbecues, stalls selling Superbock beer, Bailaricos (street dances) happen across the city, music fills the air from makeshift stages blaring anything from pop and rock music to traditional fado, people of all ages gather and dance. And, then the hammers appear, along with leeks and the garlic flowers. Yes, you read right. This is a funny tradition, but one that gets everyone laughing and joining in. The tradition is to hit the one you love on the head with a leek or clove of garlic. Over the years, this gentle bop to the head has become a sign of good luck. No one really knows how it all started, but later in the 1960’s a new element was added to this head-banging activity…the inflatable hammer. So, if you do find yourself in Porto on the evening of 23rd June, be prepared for a crazy, but fun experience to get involved in, and don’t be at all surprised if you get boped on the head with an inflatable squeaking hammer. Here’s another nice thing about travelling solo, you meet random people. One day I walked past a group of women in aprons – they were getting ready for the São João celebrations. They were giggling and jigging along to the street music which was playing on a loud speaker; a couple had already started dancing; another old lady was sat on her doorstep cutting up vegetables; and a cute elderly man was sat close watching his son fire up the grill ready for the evenings celebrations. He looked so content, so I asked if I could take his photo. He smiled and said ‘yes’, and then the family asked me to join them, so I did for a bit. Another time, I sat outside a café drinking a juice. The café was quiet and I spent 20 minutes chatting with the owner who wanted to practice his English. These are moments I really treasure. These things don’t often happen when you’re not travelling solo. Maybe it’s because your eyes are not as wide open, or you get distracted by whoever you are with. I’m sure it would have been a difference experience. Regardless, we would have had a fun still; we would have stayed out later; drank more; definitely partied at the São João festivities; ate more; laughed and chatted lots, and made memories, but solo travelling for me is ‘Me’ time. It’s me being happy making memories on my own.